As I was leaving from Pilates, I had 10 minutes at the bus stop with a view of the Munot Tower. 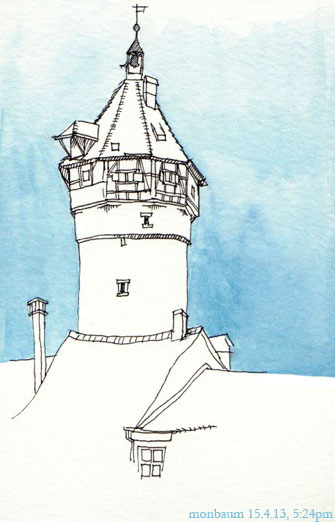 I whipped out the Mini-Moleskine and the 0.05 Pigma Micron I still had in my bag from last Saturday's sketchcrawl and completely messed up the perspective of the tower roof. Also, I must say it is quite unsatisfying when getting the image converted into a bloggable file of pretty data takes more time than than making the image itself. PS: I need to reread Perspective for Artists again, it explained the perspective of turret roofs so well. I like your very own perspective of the turret roof! It is very individual and atractive to me. Sehr schön! Ich mag diese Eine-Farbe-Anwendung!